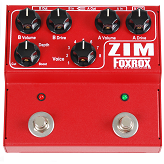 Analog Man proudly sells the Zim dual overdrive pedal made by Foxrox Electronics. This pedal has a unique voicing circuit to get many different tones. ZIM is like two separate pedals joined at the hip. Please take the time to read through all of the ZIM pages (see links above) and listen to the clips. There's a lot going on inside of ZIM,.. and with ZIMcards, it's the one pedal you can adapt to whatever your drive needs are even if they change over time. Here's a little demo video for the optional FF ZIMcard. No talking, no production value - just Dave Fox noodling through the pedal and turning knobs. He included the card being swapped at the beginning for those not familiar with ZIM. The FF card is a low-gain NPN Silicon fuzz followed by a mild overdrive stage. The two stages combine together for a decent amount of gain/sustain and the top end is smoothed out so it sounds good through a clean amp. The low gain in the FF section allows a nice vol knob clean up - not brittle like a normal high gain silicon Fuzz. This has to be one of the most innovative ideas for pedals ever. I've tried every Zim card made and every one of them does exactly what you would expect. The tubescreamer cards (T9, B9, H9) sound like different flavors of tubescreamer & they're true bypass which has a more open sound to my ears. The TAR+ sounds like a Rat. The different flavors of boost (CC, VT) are also very nice. And for me, the FF is a fantastic solo boost. I've swapped cards several times (Dave lets you do it for just the cost of shipping!) and am happy that I can do it in the future if I ever get sick of the ones I have (B9, FF). But you always need a tubescreamer and the fuzz is great. My only complaint is that all the overdrive cards have a tubescreamer-ish tone. There's no KOT or Blackstone type open sounding overdrives. But this complaint is not enough to dock the Zim any of it's 5 well deserved stars.